Guess mine didn't ship yet... Little frustrating as I put my order in for this pretty immediately after I got an email notification for it, but whatever. I hope it ships before the weekend I guess and if not by then, then maybe I'll be a little more concerned. I missed the boat again... I'm getting sick of looking around for these and Hasbro never has enough of them at a time to make it worth ordering (that I am quick enough to get at least). Where's the best place to buy cases from nowadays? I used to order from Kebco a few years ago but I guess that ship has sailed. EE.com is where I got mine. Now that you have moved away, I have to do all my own Toy Runs so I order online. Yeah, it hasn't been easier here for me either. I've got a Target that's close by but if they don't get anything in there's not much I Can do about it... I don't get out to the burbs but once every 6 weeks or so, so Walmart is largely out of the question. There's a Toys R Us about 10 minutes away but they never get anything new. I'm looking for an easy solution, without paying too much over regular retails - but the case option isn't so great for me when theres only 6 or so out of 12 that I'm in the market for. 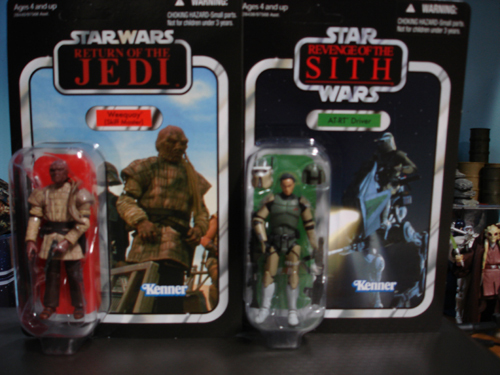 I wish HTS would just be more consistent with their offerings. Wave's back up. I actually got a few. New Marvel Universe stuff up too at $7.99 each. EDIT: 5 minutes later. 5. Lando, Weequay, and AT-RT driver back out of stock. 5 minutes. @Dressel - I would bet someone probably just cancelled their order and you lucked into it before someone else. I did that about a month ago when wave 4 and 5 went up for sale. The day before I put in an order 4 GI Joe's and an IM2 Concept Drone. When the Star Wars came in stock I wanted to cancel my order from the previous day to save on shipping and put it all on one order but Low Light was OOS. I called HTS, cancelled my order, and they said they couldn't guarantee that the GI Joe figures would still be in stock when I placed my new order - I told them I would roll the dice and see - I wanted the Star Wars figures more. About a minute after I cancelled Low Light came in stock and I placed my order. After I placed my order he was OOS again. I know I promised to be done with this wave, but just wanted to say - this is the best figure ever. Wow, the shoulders look a lot better compared to what we've previously seen. Can his arms go down to his side? I'm confused, but the arms CAN go down? They look like a typical ball-joint Scott, so I wasn't sure if that's what you meant, or that they're stuck out at the side like that. I hope that's not the case though... That looks... uh... odd. Ah, ok, I get what you're saying now. I was just a little confused. I can deal with that look, trust me. I have to say I like every figure in the wave... Everything's pretty solid, without many flaws. I figured I'd just toss out a couple of initial impressions really quick before I have to take off for the evening. Apologies for pictures, but they're about the best I can do quickly. I figured I'd start with the AOTC style Clone resculpt... It's pretty impressive, however I don't think you need to toss your old "SA" (which "Super articulated" is now sort of funny by comparison), but I think they'll blend well enough. 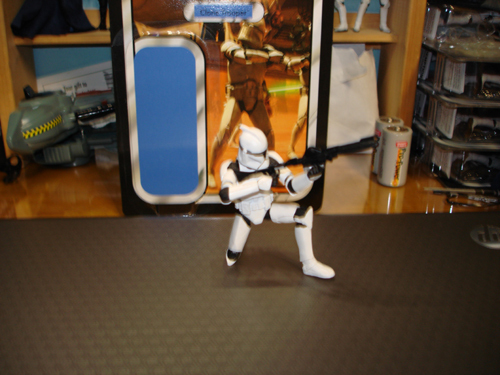 Then again I think Commtech Stormtroopers make ok filler for an Imperial army. Anyway, the sculpt's much more crisp, sharper lines... Much thinner though, which looks good to me, but it just makes the Clone look leaner is all. You get scads of articulation... Ball-jointed wrists and hips is great, and they're very useful points of articulation. Honestly they're more useful then the ankles at times I think. The helmet's removable and features a fairly younger clone underneath, who has a really nice younger looking face sculpt. His helmet fits perfectly, no bulging or anything. 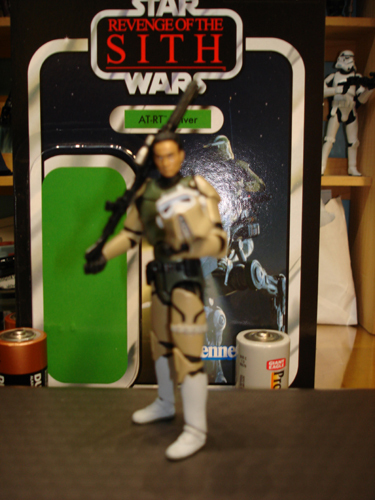 He comes with two rifles, both new sculpts (3 sculpts for both Clone weapons at this point, that's surprising). The paintjob is pretty good on mine, everything is where it ought to be, except they didn't paint the ankles black on my sample but the bodyglove is clearly sculpted to be visible down at the ankles, so that's slightly disappointing. This is easily the new definition of "Super articulated" though. And a Clone coming with all the gear you need for him is sort of a nice change since they've generally only come with the smaller blaster in the past. Now this guy has it all. 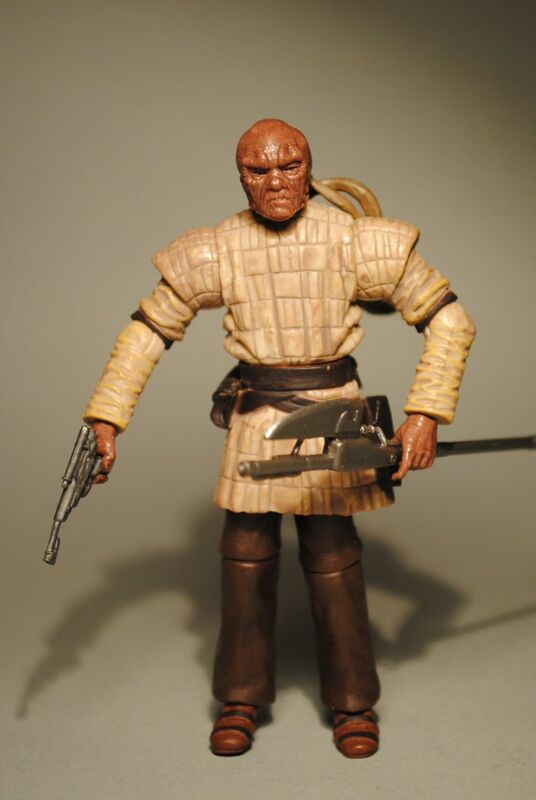 Expect officer repaints, and probably EU decoes too if they're doing realistic style Clone Wars figures. This figure surprised me, how much I liked it, and I'll likely buy more when I see them... Not many at $8.99, but I will probably get a couple more if I am able, just to have some kneeling soldiers mixed into the group. The AT-RT Pilot is really another great update... Who knew we needed this guy done over? The sculpt again is more crisp, and the colors are more vibrant. Lots of deco details which aren't that common anymore. Usually this gets the axe, but not on this guy. 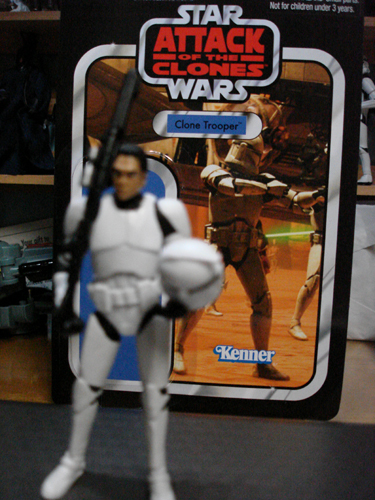 The figure has a removable helmet again as well, and the headsculpt is a slightly older clone. 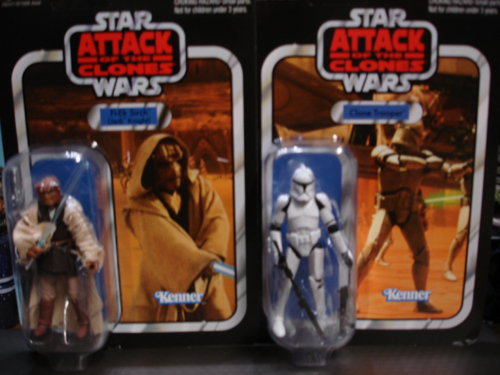 I think the head would swap with the AOTC Clone easily enough as well. As a matter o factly, I just did that, and it worked perfect. That way you can have old and young clones in both armor sets. Reason to buy two of each at least? Who doesn't like some variety in their Clone ages? The figure's hips are ball-jointed now too, which allow him to ride on his namesake's vehicle just right. He sports a removable helmet as well, and the new sculpt rifle, as well as a weapon over his shoulder which could be a rocket launcher I guess. 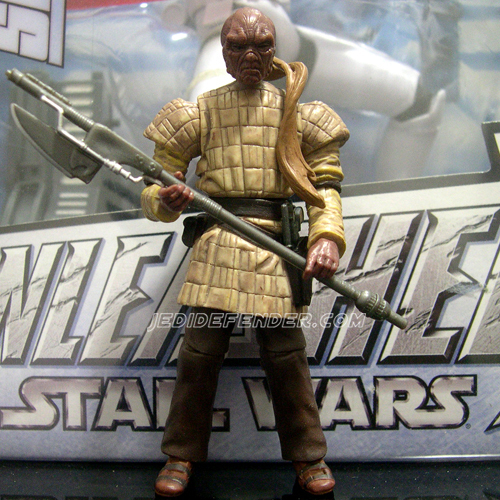 It's definitely a lot different to the ROTS figure's sling weapon. Also the sling is really cool. It's the best, most functional, most realistic sling I've seen on any figure in this scale. It's amazing really how cool it is. Paint aps are this figure's big surprise... Like I say, these days Hasbro is cheap on the details, and this one got quite a bit, at least by today's standards. 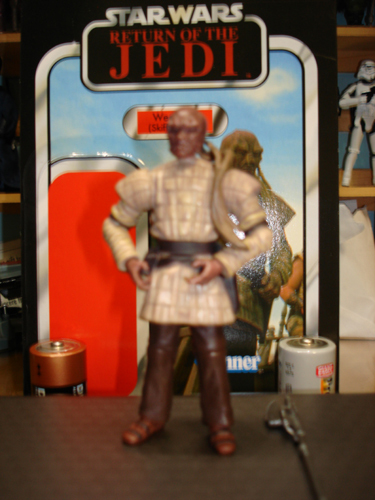 No dirt, which is ok because it'll vary it a bit from my ROTS Troopers who have some mud spray on their lower bodies. The sculpt is super crisp and sharp, lots of detailing in the costume like the ties on the boots and a coarse looking texture sculpted into the shirt. The hands and face have tons of detail like scales and horns, fingernails, etc. I particularly liked his armadillo-like plating on the top/back of his head. The paintjob is a bit more plain on him but they did do a wash on the face and hands, painted the horns and nails, etc. He's got the softgoods skirt too, so he's nice and poseable. 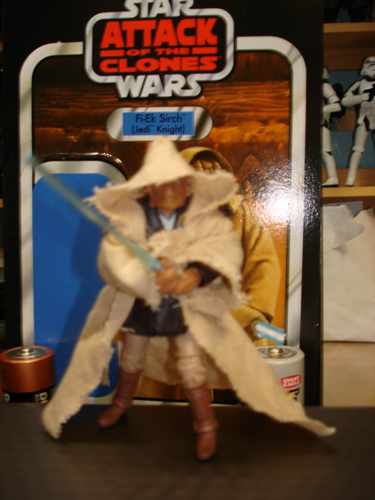 He also sports all the gear EVERY Jedi should have... an awesome burlap looking cloth robe, a hilt that plugs into his belt, and an ignited saber as well. Short of a little communicator like some figures have had that plugs on their belt, he's got everything Jedi need. Another figure that's WINNING! Dagobah Landing Luke... Actually probably one of the less impressive figures from the wave to me. The sculpt in general is ok, and the likeness is great because it looks a little like he has "helmet hair". It's a long flight to Dabogah afterall. 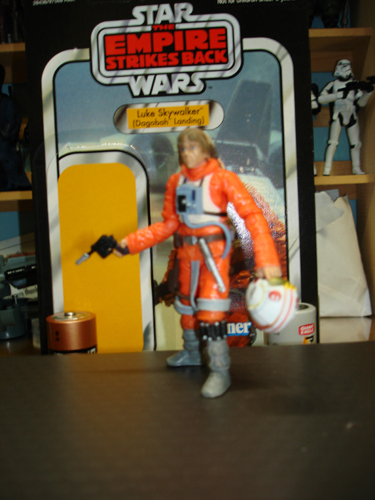 I think a lot of this is obviously Hoth Pilot Luke, but I don't have him handy to compare what's new and what isn't. Sometimes changes are incredibly subtle. He sports a saber, hilt, helmet, and pistol... Love all the gear, but would've liked seeing maybe them slip in some of his emergency equipment or something. No matter there though. The deco is ok, nothing too flashy, but I'm disappointed of course that the helmet is sparkling clean again. That's like getting the wrong saber to some folks. It's just a thing that annoys me. I'm also a tad disappointed in the arms... They're definitely oddly long, and noticebly so. I think Hasbro just overestimated how long they needed to make the new forearm pieces... It just looks a little odd. It's not a deal breaker, happy to have such a minor costume variation, but it's still just something you'll notice. First the sculpt is really sharp. It's great how they got the elongated nature of the Weequay skull... They've missed it up till now it seems, so kudos to Hasbro on that. The quilting in the costume's coat is really nicely done, looks thick and poofy. I like the pants too, and how they overlap the shoes nicely. Even the shoes have strap details on them, and the cross-draw holster rocks. Love the wrinkly face. These guys have always been cool to me for some reason. The face has tons of detail to it. He sports a blaster for in the holster, and a pike... Pretty standard fare for this guy, and appropriate. Paint aps are ok... There's more washing on him than other figures in the wave as his tunic got a wash, as did his face and hands to give it that leathery look. The articulation is great, but I'd have actually probably been just as happy with regular "cut" shoulder joints so the look of the big sleeves from the coat was a little bit better. I'm ok with it though, to me it looks fine enough either way and I appreciate the articulation. The only flaw really is the skirt... Hasbro needs to add a slit to the sides so they don't hinder the leg articulation so much. This one is nice and flexible though, a good plastic choice was made for sure, but it does inhibit the articulation at the hips a great deal. He's still able to do some walking/running poses. He won't be kneeling or sitting anytime soon though. OK, so Bespin Lando still can't disco, but obviously General Lando can! I was surprised to see them include ball-joints at his hips, actually. It seems like Hasbro went the extra mile there. The headsculpt may not be everyone's cup of tea, but I thought it was ok... The overall sculpt is fantastic though, capturing the look of the costume and all the little details like his rank tabs/chest badge, the communicator on his wrist, the wrinkles in the costume, the texture scuplted in... It's nice. The deco is fairly bland. There are some small details here and there like the silver line on his belt buckle, or his badge and whatnot, but they probably could've done some extra things to spice it up a little. It's nothing major, he's just basically less than the last two figures in the deco department. 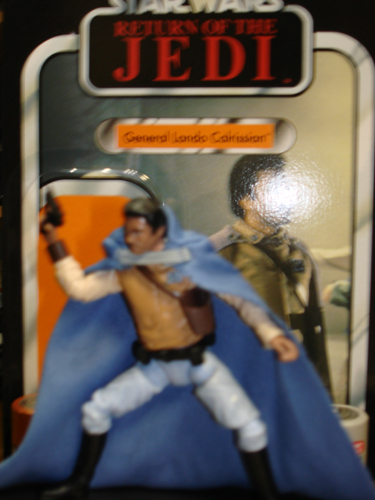 Lando's cape is cloth, he's got an easily removable shoulder holster, and a blaster that may or may not be the same one he had with his 2004-ish figure. If there's any gripe, it's on the "clasp" thing on the cape obviously. Everyone's kind of said "WTF?" on that one. A simple thick thread or grey elastic thing ala Vader capes would've sufficed and looked a lot better than a band of thick ribbon. As noted the articulation is outstanding... really beyond what this guy needed (but it's appreciated... I like the hip articulation a lot these days). 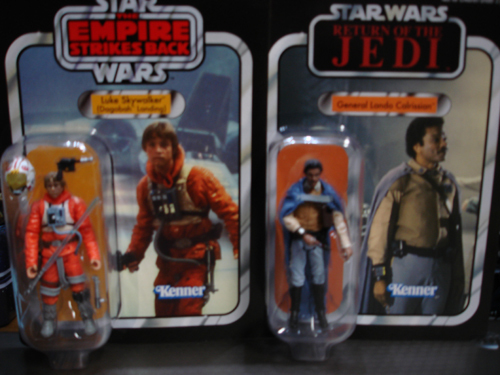 I was surprised how cool Lando turned out ultimately. The only thing to report is that the 212th and Stormtrooper still have helmet discoloration going on. Just so you'll not be shocked. I can't say mine are horrible, but they're noticeably less white than the bodies are. Sorry for the brevety of that... I gotta motor here. Hope you guys got yours today too.